About 20 years ago I purchased what I thought was a bag of Scrabble tiles. They look exactly like Scrabble tiles but they only have the letter - there's no numeric value next to the letter. Are these considered actual scrabble tiles, or were they from some other game perhaps? I appreciate any information you can give me! Hi - You can be certain that these are not Scrabble tiles. There are lots of games that have copied Scrabble's concept of lettered-tiles, but they do not copy the numerical subscripts for fear of copyright infringement. 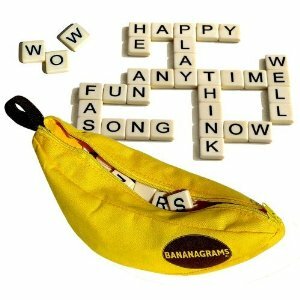 Bananagrams is a modern example (see the picture at the top of this post). It sounds like you've come across an older one. Neither Hasbro nor Mattel (the current owners of Scrabble), nor any of their predecessors, have ever released Scrabble with number-less tiles. In fact, it's hard to imagine how such a game would work. These tiles could have been from a variant Scrabble game, called Scrabble Scoring Anagrams. I'm pretty sure that comes with unnumbered tiles, or at least it used to. Have a look at these BoardgameGeek photos and see if any of them look like the tiles you have. I suspect the game would be much simpler, with the scores something on the number of words or number of letters. And I suspect they wouldn't allow words such as "QOPHS", as if one could get by without it!